iPhone Ringtone Maker + Composer Suite, All-in-one iPhone Ringtone Suite! 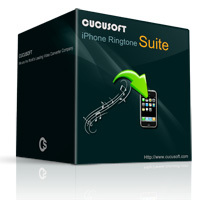 Cucusoft iPhone Ringtone Maker + Composer Suite is the complete iPhone Ringtone creation software. The suite includes two software packages, the " Cucusoft iPhone Ringtone Maker" and the "Cucusoft iPhone Ringtone Composer". Hence, with just a single program, you can convert both Audio and Video files to iPhone Ringtone and at the same time compose your very own iPhone ringtone. With this software, you can create your personal ringtone by directly clicking on the music lines to make your own musical arrangement which will result to a catchy, brilliant and amusing unique ringtone that is guaranteed to make heads turn. Showcases all the features of iPhone Ringtone Maker and iPhone Ringtone Composer. Check details of iPhone Ringtone Maker, please click here. Check details of iPhone Ringtone Composer, please click here. Comes with an efficient customer support that will always be eager to assist you. You may email your inquiries at support@cucusoft.com. Microsoft® Windows XP (SP2 or later), Windows Vista, Window 7, etc. RAM: 256MB, 512MB or above recommended.